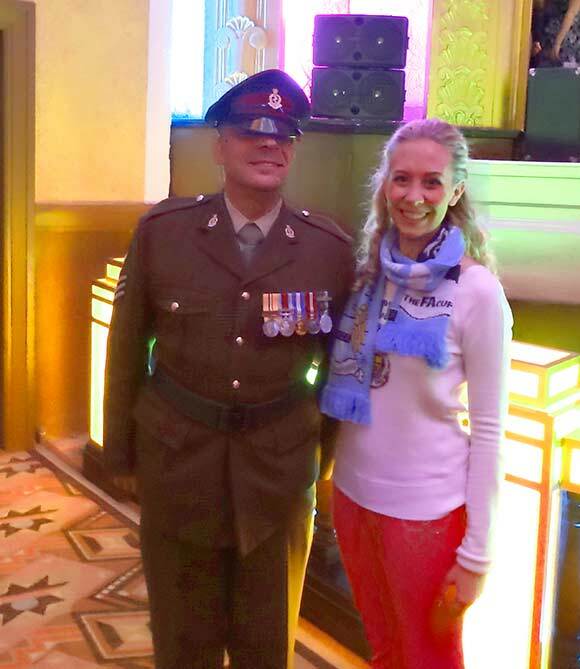 On Saturday 5th and Sunday 6th October I sang with the Tideswell Male Voice Choir at The Plaza Theatre and The Buxton Opera House alongside seven young vocalists and the original Military Wives Choir. I had to manage my final practice sessions whilst feeling a little under the weather and on the Saturday afternoon I attempted to sing, perform and manage the rehearsals full voice. I learnt later that evening that I should have taken Dame Jones advice from earlier in the week to sing half voice in rehearsal to preserve my voice as I was exhausted at the end and had to rely on the microphone more than I normally would. You have to ‘construct your own learning and not be dictated to’ said Mr J Simon Van Der Walt a lecturer at the RCS in the week. So what did I learn? The first half finale was ‘You’ll Never Walk Alone’ with the whole cast, I could not see Dennis conducting and that was a mistake, I made a note to ensure I could see him at Buxton. I read more about Eponine following my Gasworth Hall performance in preparation for the Les Mis Spectacular in the second half so that I could get the emotion right, I had great audience feedback after the show and several people told me it brought a tear to their eye. On reflection if I had a head microphone I’d like to sing ‘A Little Fall of Rain’ lying down with with my shoulders propped up against Marius (Matthew) who would be kneeling, I think it would be even more moving that way, its hard to die standing up 😉 . I used some of the comments my blogger friends had said about my performances of ‘Art is Calling for Me’, that Dennis had asked me to sing in the Saturday program, to improve my vocals including crisper consonants. I thoroughly enjoyed the performance, my Dad video recorded it for me to review – I must say the tiara adds a special something. I sang this song for my Grade 8 vocal exam and I really love it I just hope that comes over. I have written a full review in my notebook so that when I look back at my performances I can remember what I need to work on to improve them further. The finale was ‘Do you hear the people sing’ its a fabulous song to sing with a full stage of vocalists it really makes your blood pump and heart lift. I had a lie in on the Sunday morning and my parents cooked me Sunday roast for Noon which gave me loads of new energy as the days rehearsals were to start at 1:30 pm about 1 hour from home. I sang more quietly on the Sunday afternoon to preserve my voice. The acoustics in the Opera House were fabulous. 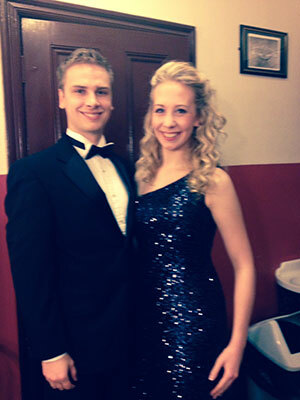 Marcus Kitchen and I sang “Time To Say Goodbye” at the Buxton Opera House. That evening I was singing ‘O Mio Babbino Caro’ and a duet with Marcus Kitchen also a vocalist from the RCS our first public outing of ‘Time To Say Goodbye’ unfortunately we could not record any of the songs at Buxton. Here is a copy of my performance with Matthew Mellor of “A Little Fall of Rain” from the Stockport Plaza. 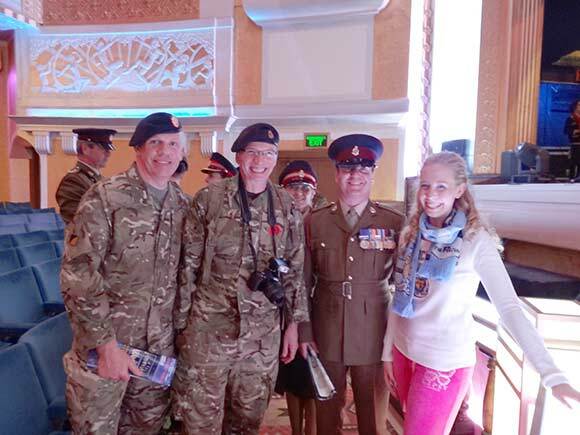 Following the concert at the Stockport Plaza I went to talk to some of the Army Medical reservists who had been so supportive of the event. 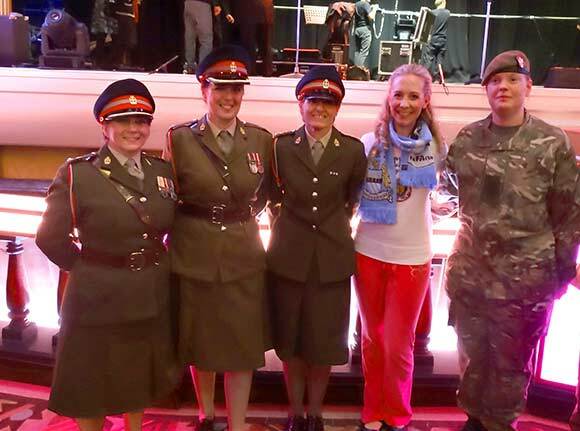 With their help it was a great success the charities they support all benefited from the amazing evening with the help of the Tideswell Male Voice choir, the Military Wives choir and these wonderful volunteers. Congratulations for the successful concert charlotte. Fantastic reviews Charlotte and well deserving. Thank you I had a fabulous weekend, a great experience, its the first time I’ve performed in two different venues in two days which was a thoroughly good thing to do. I did promise, when you first followed my blog, that I would try to get to see you in Stockport, and I kept my promise last Saturday and was very glad I did. It’s still not my music of choice and I’m not about to go mad for more, but I really did enjoy myself (notwithstanding that an awful lot of the song choices in the first half hour, from the Wives and the Men, roused powerful and difficult emotions for me). Your first half solo was sung and acted perfectly, and I thought your performances in the ‘Les Mis’ suite were outstanding. I’d have liked to have said hello afterwards, but on seeing the number of soldiers (quite understandably!) surrounding you, an old sod like me would never have gotten through! Do let us know when you’re playing Stockport again, as I could be persuaded to return. Very happy 😉 thank you I’ll let you know if I’m nearby. Beautiful performance – it gave me chills! You sing with such feeling! You are amazing, Charlotte! I am a fan! I going to Italy next year. Will you be there in May? Thank you so much for sharing!! God Bless! Hi Janice, sadly no I won’t be in Italy, unless someone wants to invite me to sing lol ;). I hope you have a wonderful time. I’ve just put ‘One Voice’ on my Facebook page if you’d like to take a look, it’s the song we start the show with. Thank you I will check it out. So sad – maybe one day I will get to see you perform. Best regards to you to Charlotte! I would agree with the comment “emotionally-charged performance”! Thank you for sharing. Great, good, top, supper, extra, genius…..;-) !!! Thank you very much for my lovely Facebook and twitter banner they are so unique, I like to be different and you have helped with that. All the best for you Charlotte. What a star! I am terrifically happy for you! You done your dad proud. And you look like you were having such a great time. That video was just beautiful! Brought a tear to my eye too, now I have to go re-do my makeup! 😉 I hope it was worth it. ‘One Voice’ is now on my Facebook its more uplifting, I’m hoping to load a copy of it in my performances section by the weekend. Now the season of these productions are over I can share a couple of them. … and I’ve not even seen the video! Come visit when you’re in NZ and I’ll have to find you when I finally make Scotland! You give me a real look into a world I’ve never entered… I sing, but haven’t made a career of it as you have. Cripes…just watched the video… Now crying in earnest! brilliant Charlotte – and you are a brilliant critical “reflexer” – well done! Thanks Andy, there’s part of me that used to hate writing down negatives but I’m learning that it really helps me to focus my training. I often get out previous adjudication reports to ensure I’ve ironed out suggested improvements. Congratulations, Charlotte, you have an amazing voice and what a lovely review, too. Loved your photos and your audio! So happy for you! Thank you for checking in on me Lauren 😉 I appreciate you visiting my Facebook page too. 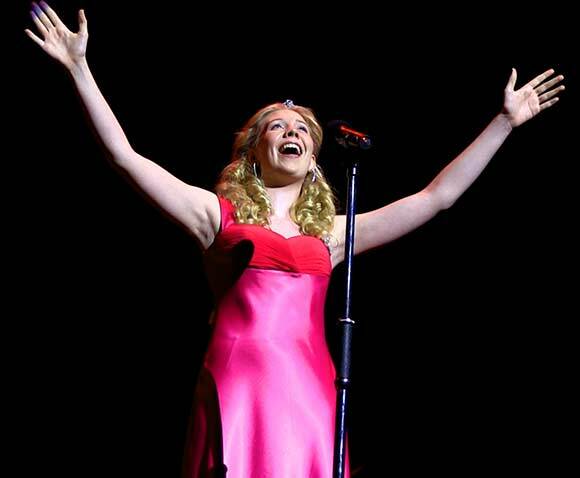 Wonderful, wonderful, wonderful…….you have such a beautiful, voice….thank you for the gift of sharing it with us. Thanks Suzanne…you’re welcome glad you enjoyed it. So exciting. One day we will be there in the audience. Thanks Arti, and your book reviews have given me some great ideas for Christmas presents. Wonderful reviews, Charlotte. Let me know if you’re ever headed for the U.S.
I’ve been to Florida and New York on holiday and I made great friends with a pianist from San Francisco, so I’d love to see and learn more about America. Maybe someday…you’ll visit Asia…Loving the voice.. I loved “A Little Fall of Rain.” I agree with you that it must have been really hard to die standing up, but I thought you carried it off magnificently; it was so touching. So you live in Scotland? I’m planning to move to England next year. Perhaps we will end up working together someday!